A computer armoire with a drop down desk provides you with great closed door storage space for your laptop or desktop computer. An armoire can be either a casual or stately piece of furniture and can go in almost any room from a living room to a bedroom to an office. This means you can essentially put your computer anywhere, so you can work with convenience, and then you can just close the doors when you're done and no one will be the wiser. When you look for a computer armoire with a drop down desk, you are likely to find a lot of different choices. Armoires have become popular due to their versatility, and you can find armoires at all different stores from office supply store to fine and fancy furniture stores. It is a good idea to set a budget for your armoire before you go shopping so you'll know which type of stores to look at and which armoires are in your price range. You'll have to decide first whether you want a real solid wood armoire or a particle board armoire. A solid wood piece of furniture is likely to be more expensive and heavier to move, however it may be more durable and last you a longer period of time. A particle board or press-board computer armoire is probably going to cost less and be lighter to move, but it may not look as nice and the condition may not stand up over time. Some particleboard or less expensive armoires may also require assembly, which can make it more difficult to put them up but easier if you have small doorways that large single pieces of furniture won't fit through. You also want to select your colors carefully. 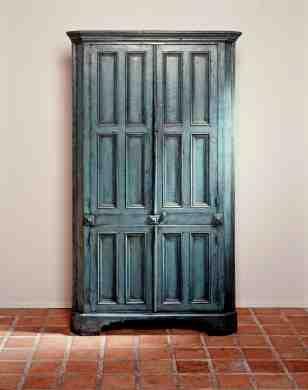 The armoire should match whatever room you are planning on putting it in. You'll have to choose from stained wood or paint grain wood, and you should make sure that if you do opt for stained wood, the piece will look nice with other furniture you have in the room and you won't have an unpleasant mix of too many different colors or stains. The unique feature of a computer armoire with a drop down desk is that the desk folds up into the armoire and then comes down when you open it up. This allows you to have a narrower armoire but still have a large desk space when it opens. This is convenient for tight spaces or for times when you want to have a big desk surface to write on but don't want the armoire or the desk to be the focal point of the room. This can be especially nice for turning a bedroom into a multi-function space. The armoire in the guest bedroom, for example, may look to guests just like a regular armoire, but if you have a drop down desk your guest room can essentially function as an office as well. While the drop down desk feature can be an advantage because of space and convenience, it can also be a disadvantage. By definition, since the desk drops down, it also folds up. This means you cannot keep anything on that desk when you fold it back into the armoire. After all, when you fold it up, you don't want your papers falling down and you certainly do not want your computer or monitor to be placed on a desk that tips upside down. If you decide that you want to maximize space without having to deal with the fact that the desk you are using folds up, you may want to consider a pull out computer desk instead of a drop down desk. A pull out desk is on a wheel track so you can pull out the desk piece when you open the armoire. This allows you to put your keyboard or other papers on this lower pull out tray desk feature so you can have more space when you open the armoire. Because the desk pulls out instead of folds up, it remains flat when you push it back in and you can keep your computer keyboard or other items stored on it.